Dunedin, FL., November 8, 2014 — When Dusty Eldredge said he wasn’t going to lose, he meant it. 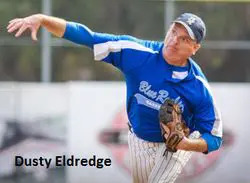 So Eldredge went out and pitched a four-hit, complete-game shutout to lead the Kennett Blue Rocks to a 6-0 win over the New Jersey Reds in the 52+ American MSBL Fall Classic Championship at Florida Auto Exchange Stadium on Saturday morning. Keeping Eldredge in check behind the plate was catcher Dave Hissey, who not only caught all of Eldredge’s complete game, but also 18 innings coming into the game. Shortstop Glenn Davis picked up MVP honors thanks to great defense all week, which helped lead the Blue Rocks to their second championship in five years.